Mon., Nov. 6, 2017, 6:53 p.m. Welcome, Eastern Washington, to the Misery-Loves-Company Bowl. Fittingly, it will be played in North Dakota. In November. Mercifully, it will be played indoors on Saturday at the Alerus Center in Grand Forks, where fans of preseason Big Sky Conference favorite North Dakota have been suffering all season with injuries to most of the Fighting Hawks’ key players. Enter Eastern Washington, which is reeling from two straight losses and now the loss of All-America quarterback Gage Gubrud and Kurt Calhoun for a violation of team rules. The suspensions come at the worst time for the Eagles (5-4 overall, 4-2 Big Sky), who must win their final two games against UND and Portland State to have any shot at the FCS playoffs. But don’t expect much sympathy from a program that shared the conference title last year with the Eagles. UND lost All-America cornerback Deion Harris for the season before it started. 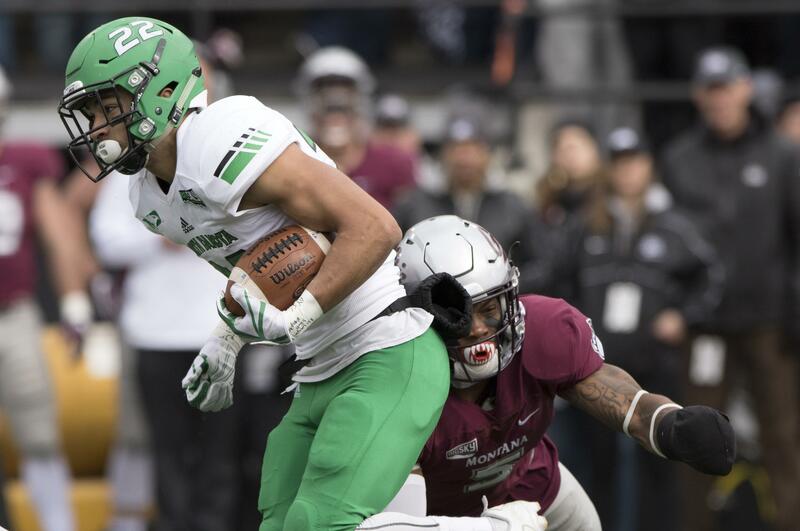 Reigning Big Sky Defensive Player of the Year safety Cole Reyes was lost for good in September, along with two key receivers. Other key players, including several seniors, have missed significant time throughout the season. However, UND 3-7 overall and 1-6 in the Big Sky) has been showing some fight lately. Three weeks ago, the Hawks lost to Sac State by a touchdown before pounding winless Portland State (48-21). On Saturday, they hung with Big Sky co-leader Southern Utah for three quarters before falling 47-21. Sound familiar, Eagle fans? The Fighting Hawks have been inconsistent on both sides of the ball. However, this is the last game of the year for UND. That means it’s Senior Day, with all the emotion it entails. Moreover, the Eagles will be starting a new quarterback in redshirt freshman Eric Barriere. The Hawks still have some weapons. Running back John Santiago ran for 115 yards against a stout SUU defense. In seven conference games, Santiago is averaging 6.1 yards per carry, while Brady Oliveira averages 5.9. Senior quarterback Keaton Studsrud is 131 for 217, for 1,626 yards, eight touchdowns and 10 interceptions. The UND defense ranks ninth in the Big Sky, allowing 474 yards per game. Published: Nov. 6, 2017, 6:53 p.m.